Bowtrol Probiotic contains 9 Billion live probiotic cells, more than 5 times the live active cultures typically found in yogurt, but without the sugar and calories. 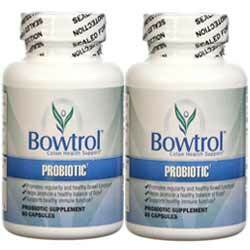 Unlike many other probiotics, the Bowtrol Probiotic is specially designed to survive the acidic stomach environment and be delivered to the intestines. Lactospore is an intestinal probiotic enhancer designed to improve gastrointestinal function and promote the balance of beneficial bacterial flora. Lactospore increases enzymes for improved digestion; inhibits the growth of pathogenic bacteria, and organisms; and enhances the bioavailability of nutrients from the food. Unlike many probiotics, Lactospore does not cause gas or bloating. Lactospore is made with an outer layer to protect against environmental changes. As a result, unlike most probiotics, Lactospore does not require refrigeration to maintain optimum potency.